Maratea is an authentic pearl located along the coast on the Tyrrhenian sea. The view offered is astonishing with mountains descending in an emerald green sea. There are sand bars, channels and inlets with small beaches, where it is possible to sunbathe, have a swim in the crystal clear water or wonder around with a boat to enjoy the always different and charming spots. The black beach of Maratea is certainly a peculiar place. But make sure you have good shoes! In summer the sand is very very hot. The town is small, consisting of coloured grouped houses mixed with a maze of tiny roads forming the village and descending to form its port. This is a place where time seems to have passed slowly. It offers ancient smells and aromas, amusing corners, balconies with hanging flowers contrasting with the coloured facades of the houses and enhancing the tiled cupolas of the churches. 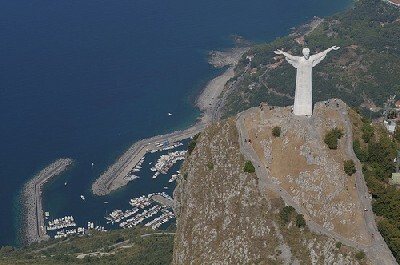 Above the village and the coast it rises the statue of Christ the Redeemer, like a great protector. It is possible to reach the statue walking up to the mountain. 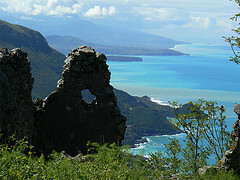 From there visitors can admire the Gulf of Policastro in one view. Astonishing. But Maratea is more than sea. The National Park of the Pollino or Monte Sirino are just a few kilometres away. This is a very well known tourist destination. In winter it is a ski destination and in summer the nature is so beautiful that many people decide to explore it in guided excursions. 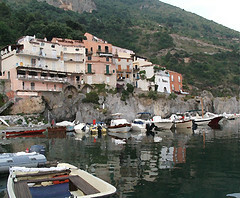 Maratea is one of the unique places in Italy, where someone should go at least once in a life! !